SAN FRANCISCO, C.A., Nov. 06 /CSRwire/ - BSR (Business for Social Responsibility), GlobeScan, and Net Impact have jointly released a new industry study which reveals how current and future leaders view the state of sustainable business, including some notable similarities, differences, and emerging trends. Overall, there is remarkable alignment between the perspectives of current and future leaders on the state of sustainable business. Results suggest that prospective business professionals are fairly realistic about the challenges that current sustainability professionals face. 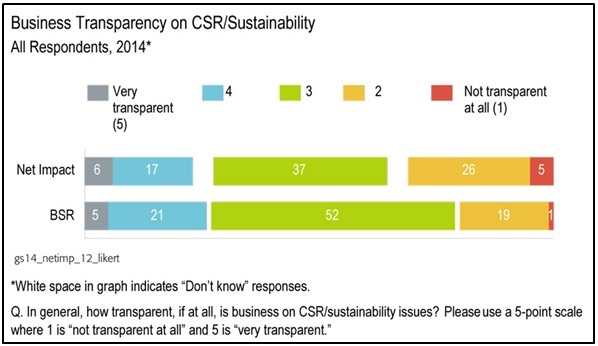 However, there are some key differences in views on transparency and priorities for sustainable business. 1. Integration of sustainability into core business functions is key. Both current and future leaders believe the most significant leadership challenge facing business today is the integration of sustainability into core business operations. “The challenge of integrating sustainability into core business functions has consistently been the top challenge highlighted by current leaders in our tracking. To see that future leaders also clearly recognize this critical challenge is welcome,” says GlobeScan Director, James Morris. “Integrating sustainability into the core of the business is a challenge that future leaders will need to take up. 2. There is enormous potential to improve business transparency. While both current and future sustainability leaders generally rate business as low on transparency, future leaders have a lower perception of business transparency in general. Net Impact students were notably more likely to say that business is characterized by a lack of transparency than BSR members (31% vs. 20%). “We believe that increased transparency is an essential solution for building trust in business,” says BSR CEO Aron Cramer. 3. Climate change will continue to be a top priority for sustainability leaders, but new priorities may surface as more millennials move into the workplace. 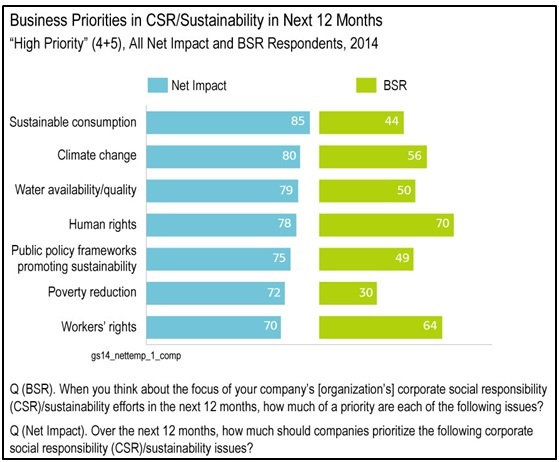 Since 2009, professionals from BSR have consistently highlighted human rights, workers’ rights, and climate change as the highest priority issues for their companies’ sustainability efforts for the next 12-momths. 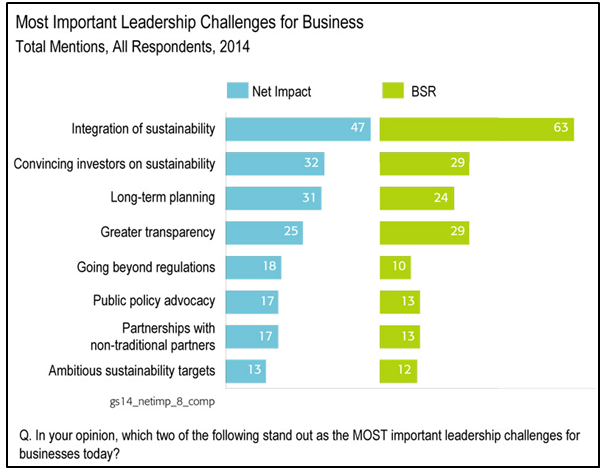 Like BSR current leaders, Net Impact future leaders agreed that climate change is a top priority issue. However, Net Impact students, who were asked to rate what should be the highest priorities for business, also ranked sustainable consumption and water issues as their burning issues of importance. Next generation leaders have high expectations for business in addressing sustainability issues, especially regarding consumption. “I am drawn to brands with a story. If businesses don’t have values that resonate with me, they are unable to provide me both reason and reward for their products,” says Kelsey Moyes, a college student member of Net Impact. These results underscore the imperative for companies to enable consumers to be more sustainable in their purchasing choices. For the past six years, GlobeScan has partnered with BSR in conducting the annual State of Sustainable Business survey. This survey gleans insights from professionals within BSR member organizations on emerging trends, priorities, and practices across a range of environmental, social, and governance issues. This year, for the first time, a number of the survey questions were extended to undergraduate and graduate student members of Net Impact, a nonprofit that empowers a new generation of sustainability leaders. The report compares the perspectives of more than 700 experienced professionals in the BSR network to almost 500 students in the Net Impact network. Complete findings from the report can be found here. Net Impact is a leading nonprofit that supports a new generation to work within and beyond business for a sustainable future. With more than 60,000 student and professional members and nearly 300 chapters worldwide, we make a net impact that transforms our lives, our organizations, and the world. Visit www.netimpact.org. BSR is a global nonprofit organization that works with its network of more than 250 member companies to build a just and sustainable world. From its offices in Asia, Europe, and North America, BSR develops sustainable business strategies and solutions through consulting, research, and cross-sector collaboration. Visit www.bsr.org for more information about BSR’s more than 20 years of leadership in sustainability. GlobeScan helps companies, multilateral organizations and NGOs measure and build valuable relationships with their stakeholders. Uniquely placed at the nexus of reputation, brand, and sustainability, GlobeScan partners with clients to build trust, drive engagement, and inspire innovation within, around, and beyond their organizations. To learn more, please visit www.globescan.com.